That was certainly the case this year, as Big Sur received soaking rain while the rest of the Los Padres stayed parched. So parched that some of the Southern Los Padres ended up burning in December’s Thomas Fire – the largest fire in modern California history. Early January finally brought soaking rain to the south – including a downpour that touched off deadly debris flows in the fire area – so it was not a surprise when, on January 19, the Forest Service lowered fire restrictions from the very restrictive Level IV, to the least restrictive Level I. Looks like their timing was bad. Only a week later, the forecast is calling for Santa Ana winds gusting to 55 mph or more and relative humidity of only 8-18 percent. As a result, a red flag fire warning has been posted for much of Southern California, including a large chunk of the Southern Los Padres National Forest. The warning runs from today through Monday evening. With a warming climate bringing ever more erratic weather, determining appropriate fire restrictions for the huge Los Padres Forest is likely to grow more challenging with every passing year. 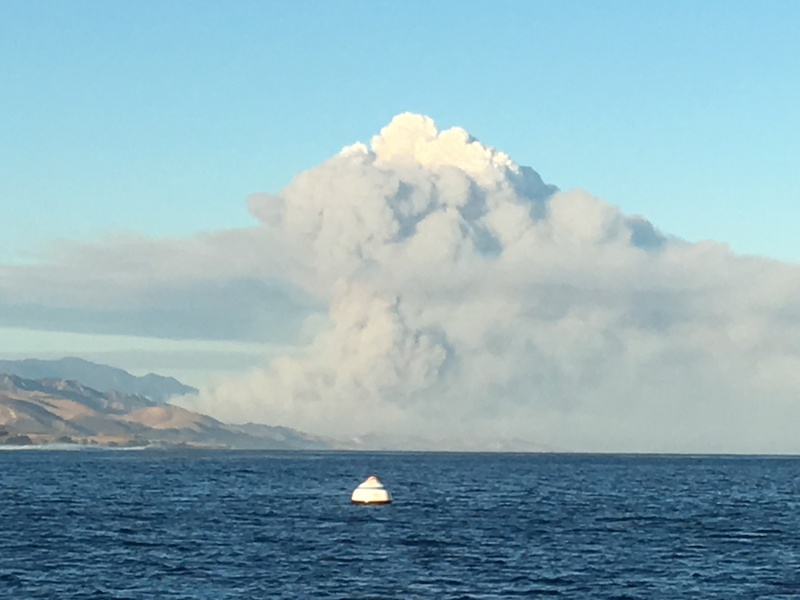 This entry was posted on Saturday, January 27th, 2018 at 2:43 pm and is filed under Big Sur, Fire, Flood & Apocalypse, History, Santa Lucias. You can follow any responses to this entry through the RSS 2.0 feed. You can leave a response, or trackback from your own site. Once upon a time, back when Gloria Brown was the Forest Supervisor, the Monterey Ranger District and the Main Division (the four southern districts) went into and came out of fire restrictions separately. It is long overdue to resume that practice. I recall as a volunteer wilderness ranger trying to explain to forest visitors that despite four inches of rain in the MRD, they had to wait for the rest of the forest to satisfy the criteria before they could have a fire. And this example shows that the opposite can happen, too, particularly at the end of the year when there is pressure to declare the fire season over. That’s not new, either. Let’s not forget December 2013, when the Pfeiffer Fire occurred, shortly after fire restrictions were lifted.